Random thoughts of an IT worker in the stone age of computer science. Warning: I'm writing this with 2.10.0 ready but not yet announced, and I've just became aware that, at the moment, reflection is not thread-safe. See issue 6240 for up-to-date information. And that's what I meant by reflection libraries in the heading: there are multiple versions of this library, exposing different amounts of API. For example, at one point the Positions API was not available on the standard library, something which was latter changed through feedback from the community. On the compiler, scala.tools.nsc.Global extends SymbolTable with CompilationUnits with Plugins with PhaseAssembly with Trees with Printers with DocComments with Positions, which exposes much more functionality (and complexity) than the layers above. Hmm, it seems that we really need to introduce `Type.resultType`, so that people don't write these huge pattern matches. Thanks for the feedback and looking forward to your next installments! upd. You need to use =:= in order to accomodate for aliases. If a method returned a type, which is an alias for Int, the first version of the code wouldn't print it out. 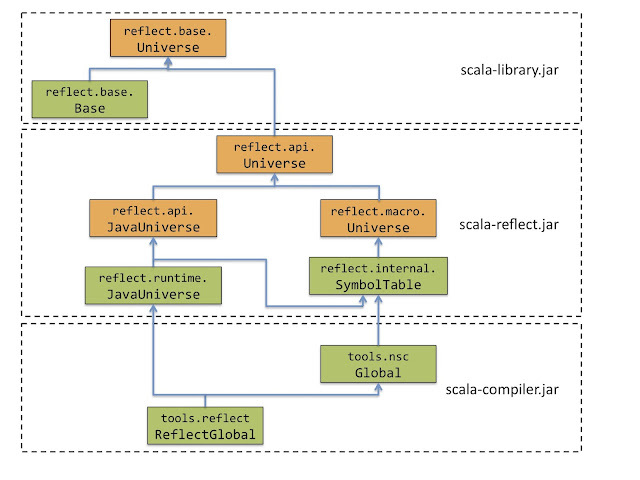 I'm trying to add some scala 2.10 reflection magic for lift-json. Wish you could give me some advice. It packs and unpacks MsgPack (binary json) and packs Json, unpacking Json not implemented yet. Still in experimental phase, far from production quality.